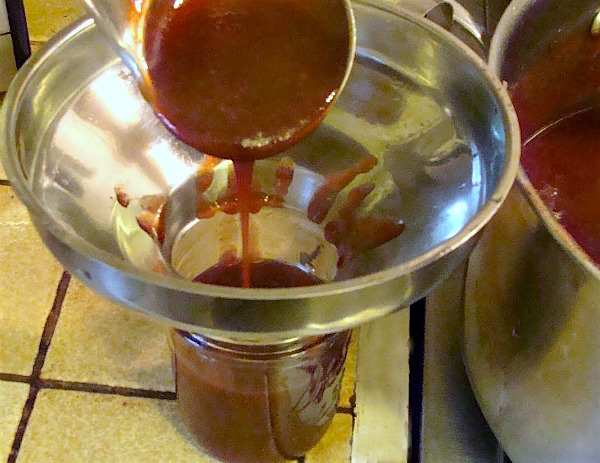 Make your own canned plum sauce for recipes and as a condiment on meats and Asian dishes. It’s super easy, tastes delicious, and makes fun gifts. 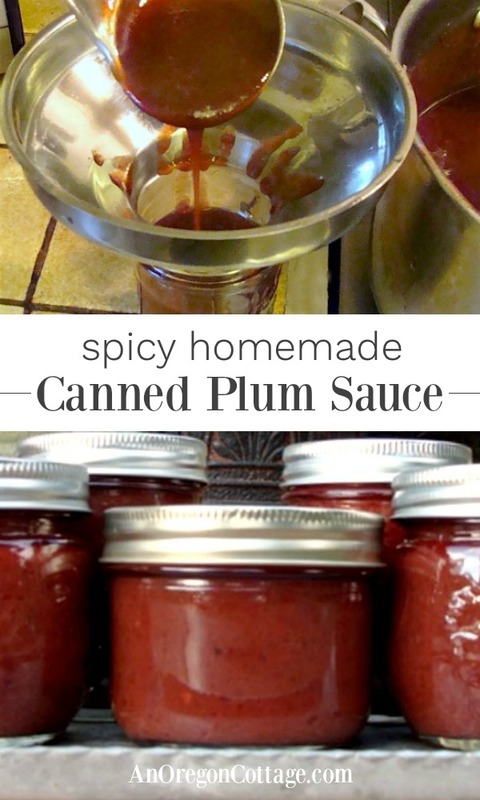 In addition to Addictive Tomato Chutney, this canned plum sauce is one of my must-have condiments to have on hand throughout the year. It adds a wonderful flavor to vegetable stir fries and baked (or grilled) chicken and pork. One of my favorite ways to use it is with faux moo-shu chicken or pork, made easy and accessible by using flour tortillas for the Chinese pancakes. Simply stir-fry cabbage, broccoli and carrots with some thinly sliced meat, add a little sauce made of soy sauce, rice vinegar, garlic and ginger at the end of stir-frying, and serve it with the tortillas and this canned plum sauce. Dinner done! The flavor of this is SO good – I think its way better than the store bought stuff. 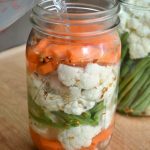 And it’s really easy to make – it’s a good beginner canning recipe. It’s also a lot cheaper than the small little bottles in stores, especially if you grow or can find the plums for free. But I have made this with regular plums and other than being a lighter color and taking a bit longer to cook, it was just as good. 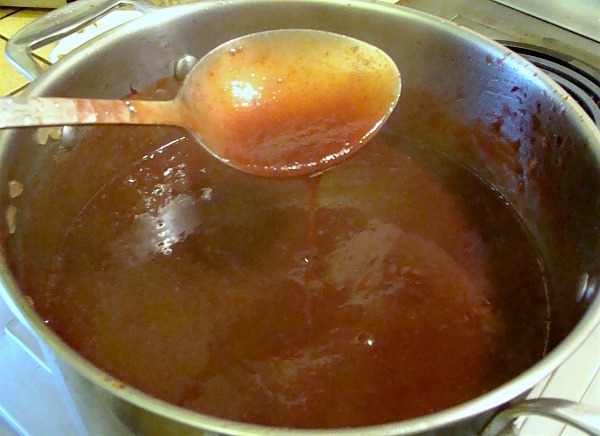 Your sauce will be the color of whatever type plum you use – Italian are dark, so this sauce is, too. I used to hand chop all the ingredients for this sauce, but when I discovered how easy the food processor made canning tomato chutney and my favorite salsa, I now use the processor for this recipe, too. 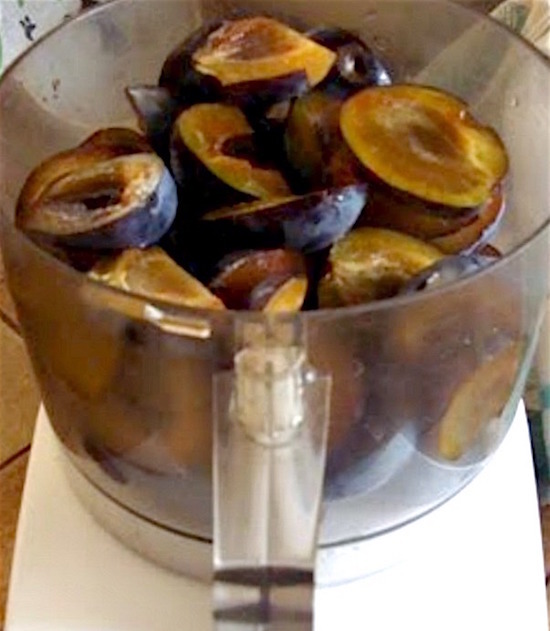 Simply cut the plums in half, remove the pit, and just throw them in the food processor. Tip: after many years using a couple of cheap, not great food processors, this is the best price-best quality food processor I use and recommend now. 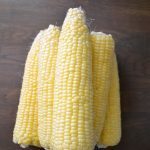 Use the processor to finely chop the onions, too, if you’d like and then throw these and all the other ingredients in a large heavy-bottomed pot. Cook for about an hour on low, stirring occasionally so it doesn’t stick to the bottom. This plum sauce literally takes just a few minutes to prepare – the rest is just stirring and canning. 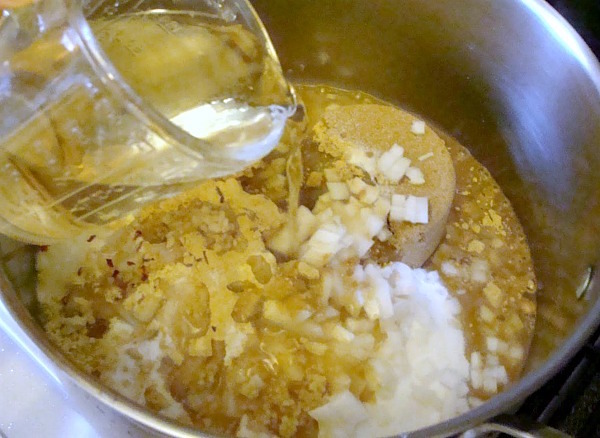 After an hour, use an immersion blender to make a smooth sauce, incorporating the skins and onions. Just process for a minute until desired consistency. 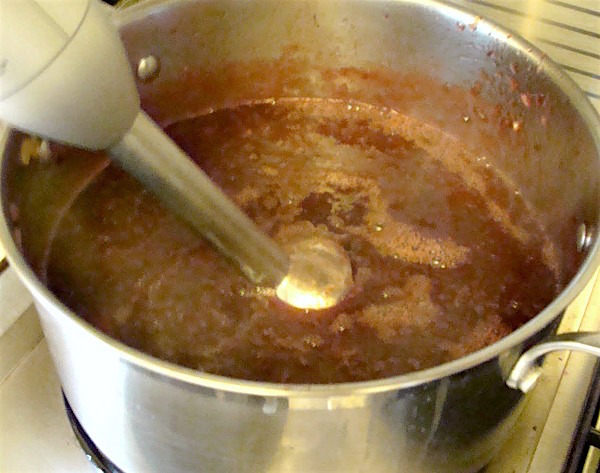 Let the plum sauce cook until it’s thick and syrupy – usually about another 45 minutes to an hour. Tip: it really wants to stick to the bottom as it thickens, so plan on hanging around the kitchen so you’re available to stir every now and then. 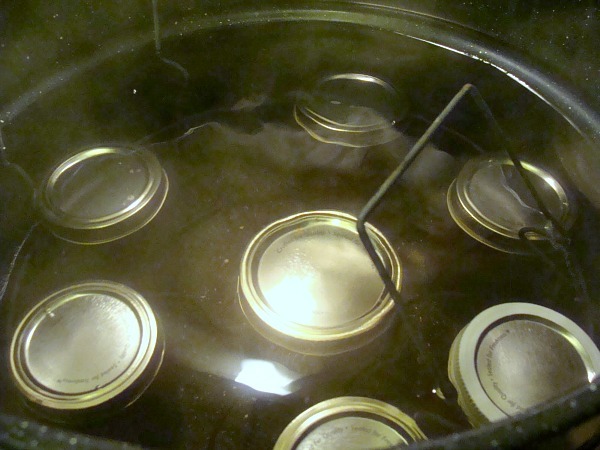 Transfer to clean, warm half-pint jar, leaving 1/4-inch headspace, and attach lids. Tip: I recommend only stainless steel utensils and canning funnel when dealing with boiling-hot food items – this list contains all the canning supplies I use. 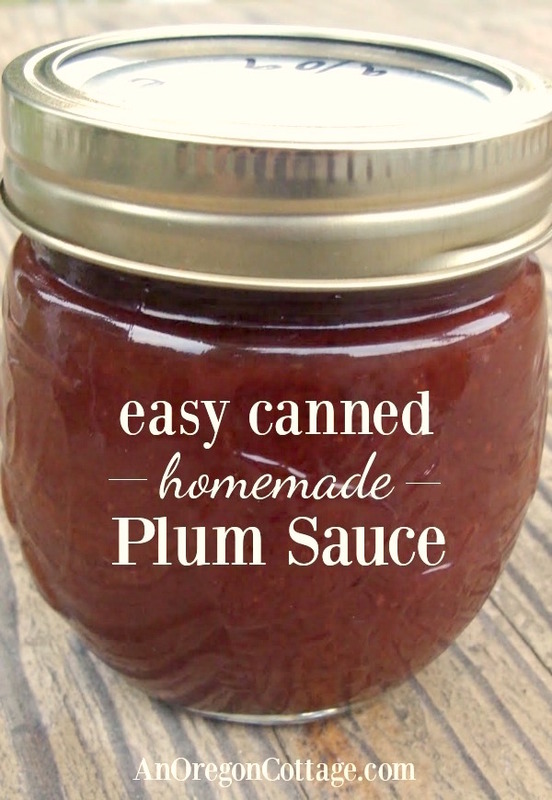 I think you will love this canned plum sauce as much as I do! Plus it makes terrific gifts. A basket of this with some Asian sauce ingredients (soy sauce, rice vinegar, ginger, garlic, etc.) and a few recipes to use it would be so fun, wouldn’t it? Thank you for the plum sauce recipe! I plan to make a batch today using Italian plums. We have a tree but a bear attacked it this year and didn’t leave us many plums. Luckily, I found somebody nearby who has an Italian plum tree and let me pick a bunch. Oh, I wish I had a friend nearby like you! Well, actually I do have a friend who let me pick, but there were so few we don’t have enough and I’m looking for another friend, ha! We have several plum trees we inherited with our property. No plums this year due to a late frost, but I’ll for sure be trying this next year. Last year for my birthday I bought myself an electric water bath canner and I love it! Doesn’t heat up my kitchen and I can use another pot on my stove if I want. It also has a clear lid so I know better when it’s boiling. Just a fun kitchen toy! That sounds great, Rosemary – I do want to try one of those one day! Thank you for the wonderful recipe! I made this last weekend and it is so yummy. It sorta reminds me of a barbaque sauce. It is definetly a keeper! This recipe looks fantastic!! I have tons of plums from my friend’s tree and am going to get the ingredients tomorrow. I’m wondering if the amount of sugar could be reduced even further? I love very tart flavors. Do you think it would be safe to can with less sugar? Yes, you can reduce sugar safely in canned items, Alex, it’s the vinegar in this that you wouldn’t want to mess with. The sugar does help with the color and such, so be aware of that. Hope you enjoy it! Have you ever tried making this recipe in a pressure cooker? I did it! And it was awesome! Yeah, Karen! We’re still waiting for ours this year. I made a half batch and the ginger was really dominant, on asking around, it seems the ball book calls for 1 TBSP of fresh ginger, which would be 1-2 tsp of dried , not 2 TBSP of dried as stated above, for a full batch. I see that others have had good results with the recipe as stated, but personally I cant taste anything but ginger. I would use 1-2 tsp in future. I am glad you posted it though, it’s a great idea for the tons of plums this year. Sounds good – I’ll have to try that with my next batch, Jo! Just put up 10 half pints of this amazing plum sauce tonight and then looking back at the recipe, I realized that I left more like a half inch space at the top of each jar not the quarter inch stated. The jars all sealed but wondering if you think there is cause for concern due to this extra space? Thanks for your amazing recipes, canning tutorial, and all the other great DIY stuff! Simmering on my stovetop now and it smells delicious. Now to decide if I should make another batch! I just made this and couldn’t stop tasting it along the way. My jars are currently cooling. I did chicken out when it came to the I T of salt so I used 1tsp and it tastes pretty darn good. Was the 1T a mistake? Yum! I made this ball recipe last month and it’s awesome with pork! I just love canning. 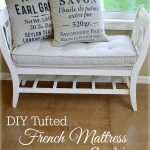 It makes me feel like a happy homemaker! Stopped by from Tasty Tuesday! Yamyy! That looks soooo good! 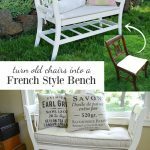 Thank-you so much for sharing! This looks so good…..I think I’m going to make this soon while those plums are still around. I made Plum Jam with these plums, it’s a real tasty jam on my blog. I’m now a follower of yours, love your Blog.